Pheasants—or to be more specific, ring-necked pheasants—have been living in the U.S. for so long that many people probably don’t realize they’re not native to the States. 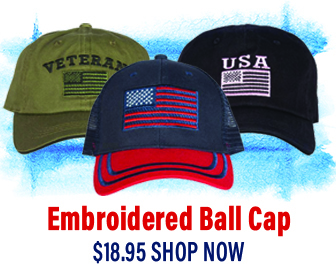 They were introduced to the U.S. from China and East Asia in the late 1800s. Now pheasants are found in their favored habitats from southern Canada southward through most mid-latitude states. In fact, Hawaii even has ring-necked pheasants. What sort of habitat do these chicken-sized birds prefer? Actually, they’re not especially picky. They like open fields, weedy roadsides, agricultural areas with brushy edges, hedgerows, grasslands, marshes, woodland borders, and even deserts if there’s safe cover and if dew, insects, and succulent vegetation can provide them sufficient moisture. When it comes to snazzy plumage, pheasants are clearly near the front of the line. Pheasant feathers of iridescent purple, copper, and gold, the striking white collar for which they are named, and lovely patterning, make pheasants among the best “dressed” birds. Both males and females have long pointed tails, which they hold at a 45-degree angle when running. Why run when you are able to fly? Perhaps because unless absolutely necessary, these somewhat plump birds would rather not expend the energy required for flight. When pheasants do fly though (usually when suddenly flushed by a person or other potential predator), they burst straight up, powered by large muscles in their chest, and attain speeds of nearly 40 mph to make a beeline for cover. Pheasants are said to be “mostly sedentary.” This doesn’t mean they sit around exchanging idle chatter all day. It means they generally do not migrate north and south with the change of seasons. Some do migrate to a limited degree, depending upon the availability of food and cover. Primarily it is the more northern populations that migrate, seeking milder temperatures. For most pheasant populations, though, dealing with the cold is manageable. Pheasants are even capable of simply remaining dormant for several days as an energy-efficient way to survive a brief, but particularly cold spell. Like most creatures, pheasants devote most of their waking hours to eating. They scratch and dig with their bills, seeking seeds, waste grain, grasshoppers, beetles, caterpillars, crickets, ants, snails, earthworms, grasses, leaves, and roots. They also forage for nuts and wild fruits in trees. As with other birds, they need to spend time and effort maintaining their feathers, and dust baths are a pheasant’s favorite way of accomplishing that. Raking the sand with their bills, scratching it with their feet, shaking their wings to sweep sand into their feathers, and even lying on their sides and rubbing their heads in the dust enable them to remove oil, dirt, dead skin, parasites, and both old feathers and the sheaths of new feathers. All those fancy pheasant feathers are not merely meant to impress us, though the fact that they do has been a hazard for these birds. The male’s iridescent feathers, the bright red wattles around his eyes, and the feather tufts behind his ears are all designed to make him more attractive to the dozen or so females he hopes to impress and mate with each spring. He’ll display these features to their best advantage by spreading the wing in closest view of his intended mate and erecting his wattles and ear tufts. He’ll also pose with his head low and call her attention to a tempting food morsel. He’ll make loud, crowing calls and wing-flapping displays, and he’ll spend time strutting and running back and forth to win the attention and favor of any and all females he wants in his harem. He’ll then defend his harem from would-be interlopers, battling, if need be, to keep other males away. 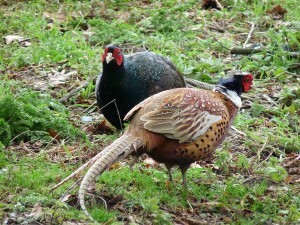 For all the elaborate attention to courtship, male pheasants offer no assistance to females after mating. Females choose the nesting site, build the nest, incubate the eggs, and raise the young on their own. For a nest site, the female will find or scrape out a small depression in the soil, surrounded by tall vegetation for safety. After lining the nest with a combination of grasses, weeds, leaves, fine twigs, corn husks, and some feathers from her own breast, she’ll lay 7-15 eggs and incubate them for 23-28 days. Once hatched, her young develop quickly, learning to fly in two weeks. They’ll stay with her for 6-7 weeks, mostly feeding themselves, and become independent by about 10 weeks. By one year of age, they’ll be ready to mate. Though pheasants are good-sized birds themselves, they are taken by numerous birds of prey, including great horned owls, red-tailed hawks, red-shouldered hawks, rough-legged hawks, Cooper’s hawks, northern goshawks, peregrine falcons, and northern harriers. As if that cast of predators were not enough, pheasants are also pursued by red badgers, domestic dogs, coyotes, badgers, mink, weasels, striped skunks, and raccoons. Now you know why they need those powerful chest muscles that enable them to catapult themselves quickly into flight! Other contributions pheasants make to their ecosystem come at less expense to them, such as helping control insect populations and dispersing seeds. As you may have known—or likely guessed when you learned that these birds were purposefully introduced— pheasants are viewed by some as “game birds.” Pheasant hunting results in several million of these birds being killed each season. Hunting is far from the only hazard that people pose to pheasants, though. Among the reasons that these birds have been declining since the mid-20th century are habitat loss and degradation and changing agricultural practices. 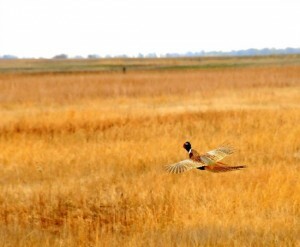 Eliminating edge habitat, destroying wetlands, burning grasslands, and using chemical herbicides, pesticides, and fertilizers all take a toll on pheasants. Many nests of young are lost as a result of earlier hay mowing, and additional deaths result from cars hitting pheasants as they forage along roadsides. 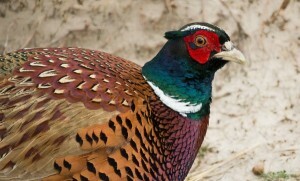 Still, many people do appreciate pheasants and try to preserve habitat for them. 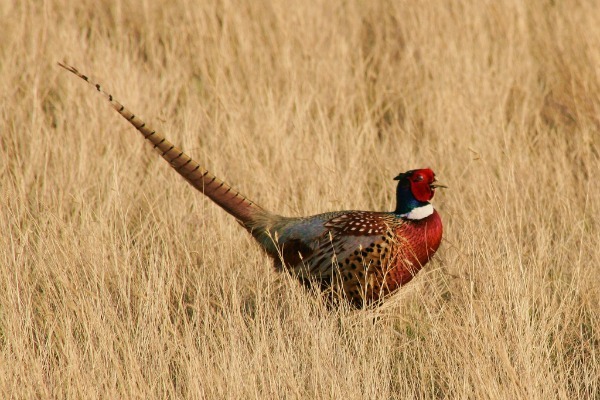 Also, an increasing number of forward-thinking farmers are starting to pay attention to the positive difference they can make for pheasants and other ground-nesting birds by making even small adjustments to their farming practices. Though many pheasant populations are declining, ring-necked pheasants are still relatively common. That means there is still hope for human choices to evolve, so that these fascinating birds may continue to flourish.